Volen Siderov, leader of the Ataka party – part of the United Patriots, the ultra-nationalist grouping that is the minority partner in Bulgaria’s government – said in a television interview on October 7 that he wanted someone from his party to take over the vacant post of Interior Ministry chief secretary. Siderov was speaking in a television interview the day after reports that his wife had been involved in a road rage incident in Sofia, in which she was allegedly aggressively pursued by a Sudanese citizen. Siderov, who described alleged assailant Magdi Ghanduor as a “half-man, a freak” said that he had referred information from Ghanduor’s Facebook page to the State Agency for National Security. On the Facebook page, Ghanduor posted photos of himself in September 2016 wearing military uniform. In a brief statement on October 6, the Interior Ministry said that the Sudanese citizen had been fined for breaking the Road Traffic Act because his driving licence was not valid in Bulgaria. The licence plates of his vehicle were confiscated. The Ataka leader’s comments come after Mladen Marinov resigned as Interior Ministry chief secretary, to be voted by Parliament on September 20 to become Interior Minister. There has been no clarity since then about who will be appointed the new chief secretary. However, Bulgarian-language media have speculated that Siderov wants the post to go Svetlozar Lazarov, who was chief secretary of Bulgaria’s Interior Ministry from June 2013 to March 2015. Lazarov was appointed to the post at the time of the 2013/14 “Oresharski” administration. 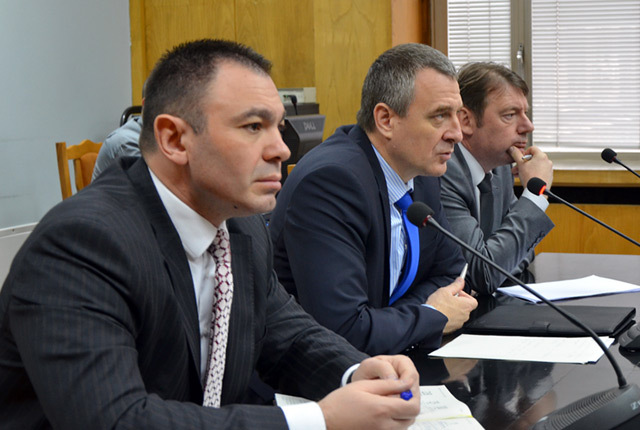 Lazarov in April 2014, with then-interior minister Tsvetlin Yovchev and the then-head of the State Agency for National Security, Vladimir Pisanchev. In early June 2017, it emerged that Lazarov had been appointed national co-ordinator of Siderov’s Ataka party. Lazarov’s duties at the party included foreign policy communication and liaison with civil associations. Some hours after Siderov’s comments on television on October 7, Bulgarian National Radio reported Lazarov as confirming that he had resigned from his Ataka party post. Lazarov told BNR that he had resigned at noon on October 5. On September 20, Tsvetan Tsvetanov, parliamentary leader of Prime Minister Boiko Borissov’s GERB party, said that the appointment of the new Interior Ministry chief secretary would be agreed between the Prime Minister, Interior Minister and the President.